Aside from being a delicious pastry, a Raspberry Pi can be one of the greatest tools available to a maker! The Raspberry Pi is a fully functional computer that can cost as little as $10. 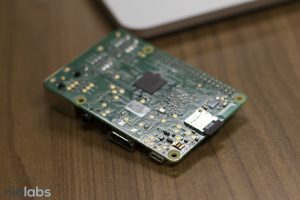 It has an operating system, Wi-Fi, HDMI display, and GPIO pins to connect and control all types of devices. Raspberry Pis have shown great use in teaching programming, hacking fun projects, and even serving as edge computing nodes! This blog will walk you through all of the steps needed to set up a Raspberry Pi. There are also instructions for installing nio once your Pi is up and running so you can easily hack together your own projects or even create your own edge computing node within a distributed network. There are many Raspberry Pi operating systems available to download. Raspbian is a great choice as it is made specifically for the Raspberry Pi architecture. It comes in a desktop or lite version for working through a GUI or just the terminal. For a lot of nio projects, the lite version is all we need to get started. Selecting the Download Zip option will download a zip file containing the image. This is the most common way to download the image file but it might be slow. If you have a BitTorrent client, you can select Download Torrent for a faster download. The image that you obtain for your Raspberry Pi needs to be flashed onto the microSD card. This makes the SD card the main drive for the Raspberry Pi which loads in the operating system. Etcher is an easy and simple tool for this job. 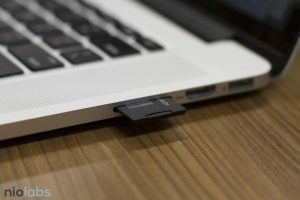 With your micro SD card in the adapter, place it into your computer's sd card reader. Open Etcher and select the Raspbian image (a raspbian file ending in .zip or .img). Your SD card should be autodetected as the drive to flash to. Click the flash button and let Etcher do it’s thing! Once the SD card is flashed, we will want to access it while it is still in your computer. This configuration step is important because it will tell the Raspberry Pi how to connect to your home Wi-Fi network and how to allow your computer to access it remotely. Etcher will unmount the SD card after flashing, so you will need to unplug and replug the card back into your computer to remount it. To find where the SD card mounts on your system run the command sudo df -h in your terminal to show all of the filesystems mounted on your machine. It will typically mount at a directory under /Volumes like the last filesystem shown in the image above. Change directories to that mount location with the command: cd /Volumes/boot. Create an empty file at this location named “ssh” with the command touch ssh. This will enable SSH access to the Pi from an outside machine. This is useful so you don’t need to connect the Pi to a keyboard and monitor each time you need to make a change to it. Now Raspbian is configured with everything it will need for you to connect to it from your computer. Change directories out of the mounted filesystem cd ~. Eject the card from your machine and place the microSD card into the Raspberry Pi. **Note: If an IP Address still does not show up in the boot sequence, remount the SD card onto your computer and double check your network settings. If you still cannot determine the IP of the Pi, try plugging in a USB keyboard and HDMI display. Login to the Pi (usr: pi, pwd: raspberry) and run the command ifconfig to see if an IP has been assigned under wlan0. You now have a functioning Raspberry Pi that can be interfaced through your own computer. The next step is to install nio and start building awesome things! This part is made easy thanks to the developers here at nio. Download the nio binary from account.n.io/binaries/download after agreeing to the license agreement. This download will provide a wheel which is the python package that installs nio onto a device. Simply copy your binary .whl file onto the Pi and run the installation command below. Replacing above fields with the path to your binary .whl file and the IP address of the Pi. This command will ask you to enter the password of the Pi (raspberry). You will know this command has succeeded when your terminal displays a similar conformation as the one below. bash -c "$(curl -s https://raw.githubusercontent.com/niolabs/nio_install/master/rpi_nio_install.sh)"
It will then run through everything required get a basic instance of nio up and running on your Raspberry Pi. The install overall will take roughly 15-20 minutes depending on your Pi. At the end of this script you should see the below success message notifying you that the nio instance on the Raspberry Pi is up and running. The first is the name that you would like to give to the nio project directory. Instructions on how to configure a Pubkeeper server in the cloud can be found here under the step Create a System. Create a new System or connect to an existing System. Click + create new instance. Fill out the menu with a name for your instance, the IP Address of the Pi, and the port that the instance is running from (8181 by default). From here you can create services, configure blocks, and build awesome things! A great reference to start building is the workshops. When you need to shutdown your Pi. The best practice is to send your Pi a shutdown command. While ssh'd into the Pi, enter sudo shutdown -h now. There are plenty of nio blocks available specifically for interacting with the Raspberry Pi. Blocks such as GPIORead, GPIOWrite, HTU21D, AccelerometerChip, and more have specific implementations for running on a Raspberry Pi.